Uphill Against the Meltemi Ain’t No Fun. With Alex’s and Milo’s Grand Tour successfully completed, it was time to head back North to pick up the Uncanin’s in Naxos in a week’s time. This meant battling the meltemi northwards. We left Santorini (probably for the last time) and headed towards Sikinos, a Greek Island that had alluded us so far. The Meltemi initially behaved itself as we left the cauldron, but soon through a wobbly and picked up to 45kts on the nose. We set a bit of a tacking angle with a motor running and a couple of reefs in. Eric the Autopilot was enjoying the nasty chop and kept wanting to round-up. So on his the dive masts for a bit of manual steering in the spray that was hitting us in the face. After a couple of hours of alternating at the wheel we reached the lea of Sikinos and got Eric to play ball again as we tacked along the coast to the one and only decent anchorage, being the main port. We dropped anchor on beautiful sand and enjoyed the peace and quiet of a not too much going on at all place. We did however hire a couple of scooters and take off and explore the island in a relatively car free environment. Somehow they had managed to build some beautiful roads on the island so it was a pleasure to scoot around. The one service station through us for a while until we worked out the lack of an attendant was due to it being automatic. We went up to an old church at the end of the island, climbed up to the monastery at the top of a tiny chora, ate a nice lunch at the said chora and swam at a nice beach with a good looking restaurant. We also stopped at the island’s sole winery perched on the side of a cliff to watch the sun go down. It only took about 4 hours to knock off the entire island. After a relaxing couple of nights there, it was time to brave the meltemi and keep heading north. Our next destination was the little Cyclades, which believe it or not, is made up of a number of (very cute) little islands. But first we had to get there and this involved bashing our way up the channel between Ios and Sikonos. Once we’d done this we got a bit of a reach across to Schionoussa, our first Little Cyclades destination. We checked out a few anchorages and decided on the port, where we dropped anchor and tied our bum to shore, next to one of the two huge private launches that are owned by a couple of Greek shipping magnates, and supposedly spend all of their time anchored permanently in this bay. We had plans of spending a couple of nights there but next day the wind started blowing on our nose and we weren’t too impressed with the holding in the bay so we decided to try a different Little Cyclades. We pulled anchor and shot over to Koufonisia. Once again it was blowing 40kts but we got a good anchorage in the bay over nice sand. I love a good holding! We dingied into town and were blown away by one of the cutest little choras we’d come across. It was one of those secret places that only the Greeks know about because there were plenty of Greeks holidaying there. The island also has some great beaches, and as the sun set, you could see all the people walking back from the beaches to the chora. Soon the chora was a lively mass of people, with great bars and restaurants overlooking the port and small marina (which we didn’t use). Next morning it was up early to pick up Zeljko, Rachel, Danijela and Ben from Naxos. Our cunning plan was to avoid the channel between Naxos and Paros and head round the west side of Naxos. The plan was working very smoothly right up to about half way up Naxos as we had a light wind from the south of all directions. Then wham – in came the Meltemi – at full strength. We battled it for about 30 minutes and them realized we weren’t going anywhere. We decided to give it away and head to the south of Naxos where we would get them to catch a taxi to. We settled on Kalantos at the bottom of Naxos as the alternate pick up point and pulled into the wall there to await the Uncanins. This entry was posted in Greece and tagged Koufonisia, Schionoussa, sikonos by stull61. Bookmark the permalink. I’ve been following your movements via your blogs & MMSI with much envy. Glad the episode in Naxos didn’t dampen your enthusiasm. 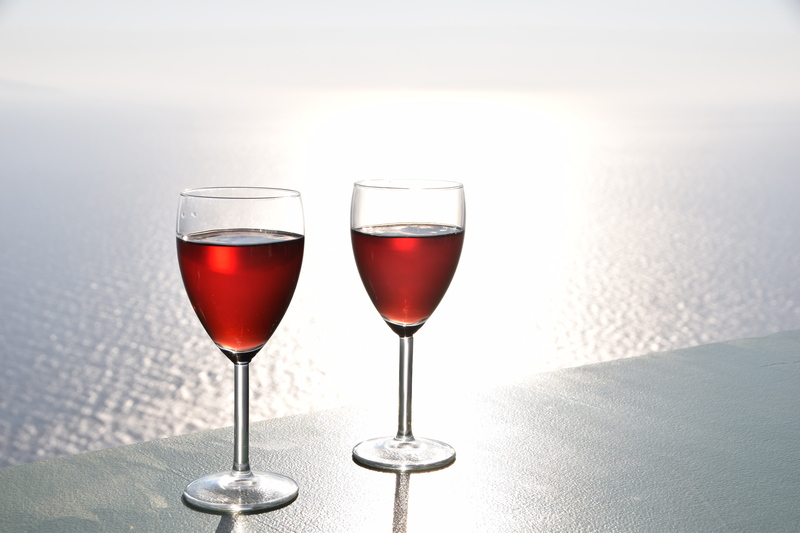 Really like your wine glass photo at Sikonos. May your Bays be calm & light breezes in your sails under the warm Greek sun. Thanks Chuck…you guys must be getting pretty close to your USA Bikers adventure. Yes we head out at sparrows Thursday morning. Will send you an email with our intinerary to grapes & lager email. It’ll be great to get out of this cold weather.